Picture the scene: Gustav Holst has collaborated with Duke Ellington and the resulting composition is being performed by a 16-piece orchestra underneath a seven-metre wide model of the Moon, with the audience walking around them. Too tough for you to imagine? Us too! Peter Long is the musical director of the Ronnie Scott’s Jazz Orchestra and leader of The Echoes of Ellington Orchestra. For the last thirty years he has been researching and re-creating the music of Duke Ellington. But why did he rescore what is probably one of the best-known and best-loved classical suites of music? Their concert will take place in The Apex, with the band performing underneath a stunning art installation 'Museum of the Moon'. Measuring 7m in diameter, Luke Jerram’s Moon uses detailed NASA imagery of the lunar surface to make each centimetre of the internally-lit sculpture represent 5km of the moon’s surface. Part of the Suffolk Science Festival, the Moon will be hanging in The Apex auditorium from 19th to 23rd February, giving visitors an up-close, surreal experience, with its nearness heightening the feeling of gazing at a full moon. Pete Long and the Echoes of Ellington Orchestra perform Jazz Planets at The Apex in Bury St Edmunds on Tuesday 19 February. 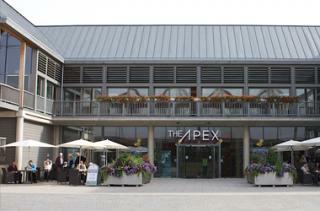 Ring the box office on 01284 758000 or see www.theapex.co.uk for more information. Betfred is a leading betting and gaming store. This bookmakers is the second store to open in Bury St Edmunds. The Abbeygate Cinema features all the latest cinematic releases and has its own café and restaurant. Bury St Edmunds Cricket Club is a leading community cricket club in Suffolk.